Canoe Day, a photo by thehutch on Flickr. 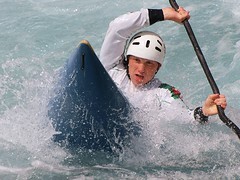 Watching the GB selection races at Lee Valley is a visible and physical demonstration of life….the currents twist and turn and attempt to push you off track but with skill and determination, it is possible to direct a pathway through these things and come out the end rejoicing. I am full of admiration for these competitors and in watching them, learned a valuable lesson in life. Good job Team GBR and all competitors! Canadian team selections are coming up soon as well. Exciting!